Looking for Solutions for Your Team? Provide your team with the talent development resources and opportunities they need to be successful all year long. Introducing Resource Centers! Now Part of Pro Plus Group Membership. 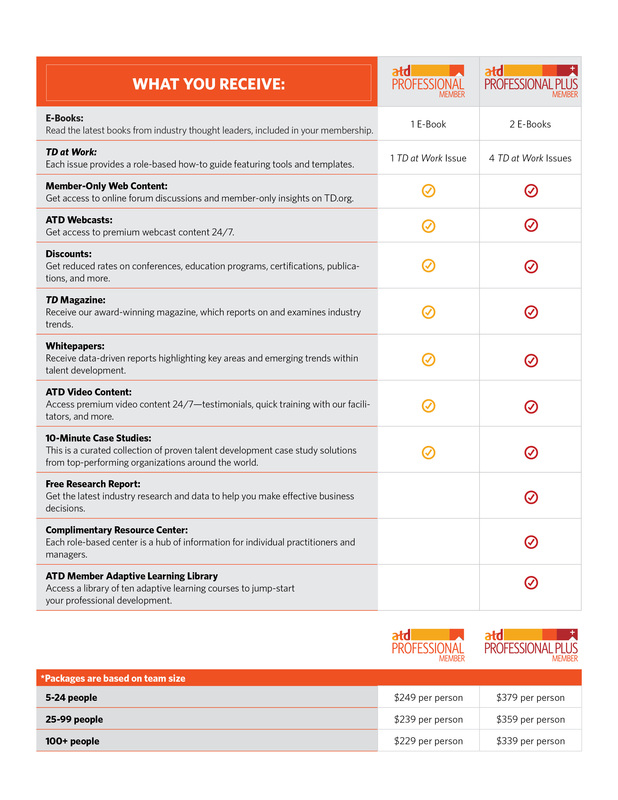 ATD Resource Centers provide the relevant content your team needs to be successful in their roles. Each role-based center is a hub of information to help make work easier. From conference session recordings to whitepapers, each resource center empowers talent development professionals with content they need, when they need it. Why invest in Group membership? Content and Resources: Whether your team members are new to the profession or senior practitioners, everyone benefits from the latest learning tips and best practices. ATD Group membership includes a complimentary TD at Work issue, a customizable online library, access to member-only webcasts, and more! Cost Savings: Member discounts apply to books, the ATD International Conference & Exposition, public workshops, and events. Employee Engagement: Employees who receive professional development tend to stay in their jobs longer. Competitiveness: Effective training keeps your organization competitive in a changing world.